Combine all of the ingredients in a bowl and mix to combine. Season both sides of the ribs with a generous amount of spice rub and store in the fridge at least 3 hours, preferably overnight. Pre-heat oven to 235 degrees F. Season the ribs with half a teaspoon of salt on both sides. In a measuring cup, combine the beer or cider and next 3 ingredients, mix and set aside. Place ribs, meaty side up, on a double-lined tin foil sheet and seal up all but one end Pour the beer mixture into the open end of the foil, make sure it distributes to the bottom, seal the tin foil, and put on a baking sheet in the oven for 2 1/2 hours. While the ribs are cooking, add all of the ingredients to a heavy bottom pot and bring to a simmer. Cook for 30 minutes, stirring frequently. Adjust for seasoning along the way, it may need more red pepper flakes or brown sugar. When done, set aside or store in fridge for up to 7 days. Add the red cabbage and next 4 ingredients to a large bowl, mix well and keep in the fridge until ready to serve. Add the mayo and next 3 ingredients to a bowl along with a 1/4 teaspoon of salt and a couple cracks of pepper. Whisk well, adding 1 to 2 tablespoons of water to make the dressing pourable. Check for seasoning, you want the flavor to be the acidic side, so you may need more lime juice. When ready to eat, mix the slaw with just enough dressing to coat everything thoroughly. To prevent the slaw from getting soggy, try to toss it with the dressing right before you eat it. Take ribs out of the oven but leave in the foil. Brush on a generous amount of BBQ sauce on the top side of the ribs and put under the broiler for 5-7 minutes until bubbly and sticky. 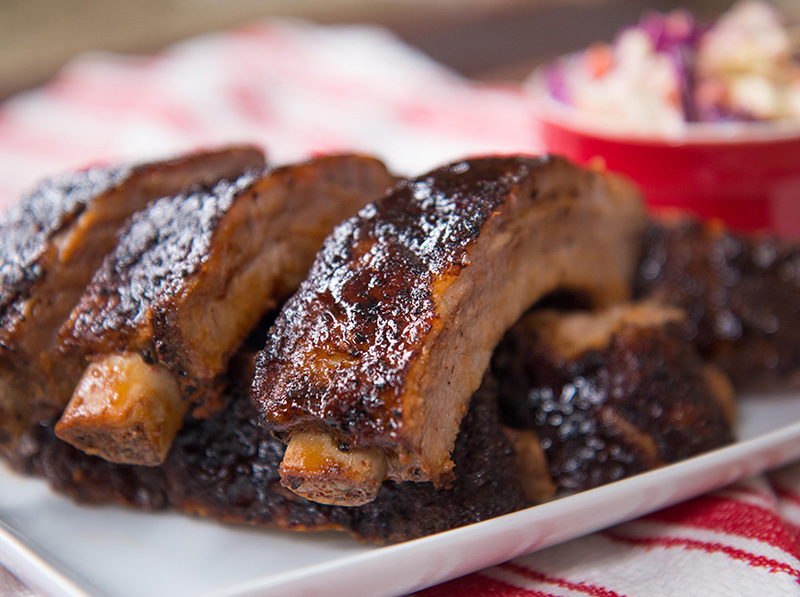 Cut ribs into portions and serve with extra BBQ sauce and the dressed slaw. Enjoy!